With its easy-to-use and clear step-by-step format, the Good Night, Sleep Tight Workbook will help tired parents create and follow an effective sleep plan to achieve sleep success for their kids with special needs—toddlers to tweens. Thousands of parents have successfully used Kim West’s methods by using her now- classic how-to book, The Sleep Lady’s Good Night Sleep Tight. 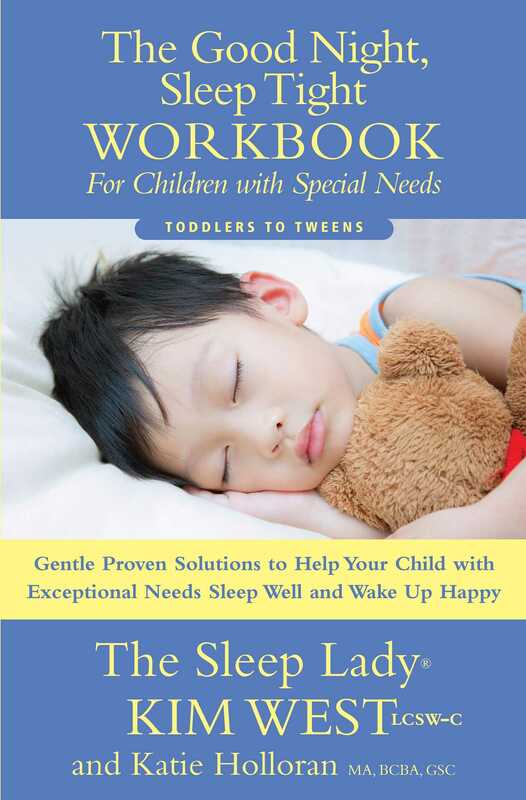 Over the years since it was first published, many parents of children with special needs have asked her for a simple, easy-to-use companion to help them organize and apply The Sleep Lady method of helping their children learn to sleep. This special companion workbook provides all the tools and tips from Kim’s gentle and effective approach to putting babies and children, including her signature Sleep Lady Shuffle. With its easy-to-use and clear step-by-step format The Good Night Sleep Tight Workbook for Children with Special Needs will help tired parents create and follow an effective sleep plan to achieve sleep success for babies and children of any age. KIM WEST is a mother of two and a Licensed Clinical Social Worker who has been a practicing child and family therapist for 25 years. Known as The Sleep Lady by her clients, over the past 20 years she has helped tens of thousands of tired parents all over the world get a good night's sleep without letting their children cry it out alone. Kim has appeared on the Dr. Phil Show, Today, NBC Nightly News, Good Morning America, and CNN. Kim is also the author of The Sleep Lady's Good Night, Sleep Tight, The Good Night Sleep Tight Workbook, and 52 Sleep Secrets for Babies. Dedicated to providing tired parents with excellent sleep advice and coaching, she started training Gentle Sleep Coaches all over the world in 2010. Katie Holloran is a Gentle Sleep Coach focusing on parents with children with special needs. As a special education teacher, board certified behavior analyst and mom, Katie has worked with hundreds of children who have special needs and their families to find evidence-based solutions to the many unique challenges they face.